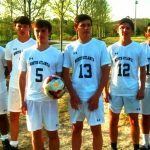 Come out this Wednesday night (4/19) for the last Varsity Soccer games of the regular season. NAHS is at home vs. Northview, celebrating our Seniors between games. Girls start at 6:00. Boys start at 8:00. Hope to see you there!